T minus one day til the big event! I think I’ve written here before about my very favourite thing about ocean swimming. It’s that moment when you dive under your first wave of the swim. All of a sudden it’s quiet. All the chatter, the excitement on the beach catching up with friends, the crashing of the waves…all of that just goes quiet and it’s just me and the water. 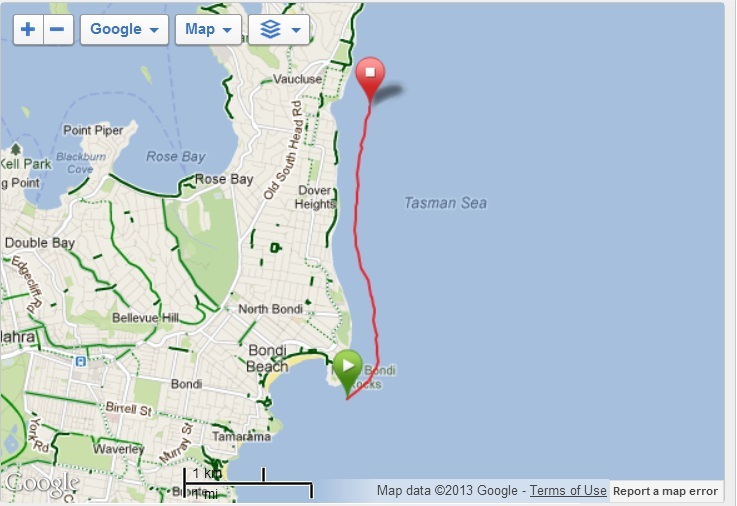 It was a bit of a challenging day, the Saturday sessions lately have been really flat and full of destination swims. Not today. The waves were big and messy and the only thing for it was a good session of ins and outs. The thing about a day like that, is you need to be really focussed or you’re going to get cleaned up by a wave. You need to be looking ahead, watching the sets roll in, getting under them, and then straight back up looking for the next one and hoping to get a few strokes underway in between so you make some forward progress. I didn’t take my camera out, figuring it’d be too difficult to take pictures under the circumstances, but I did get to try out the Garmin 910 I’ve generously got on loan for tomorrow’s event. I mentioned it when I did my follow-up review of my Garmin Forerunner 10, but I just like I need to say again…that thing is awesome. It’s so on my birthday list! 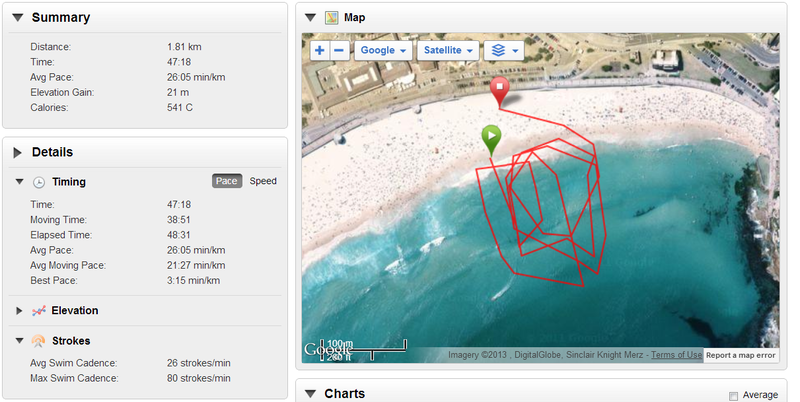 I came out after only the first session (no double-ups for me today on taper) feeling much calmer than I had gone in. My realisation? It’s just swimming. Tomorrow might be swimming a long way, but it’s just swimming, and I can do that. 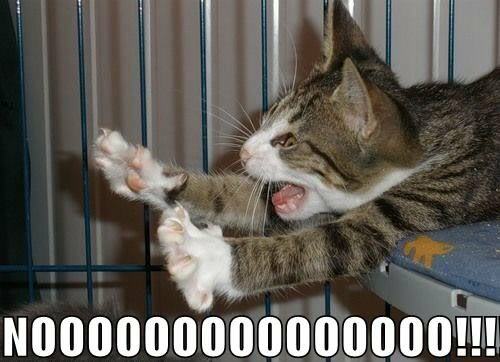 Try not to laugh too hard at the pace…it was rough and I was on taper! Friday night. T minus two days to the big event. Around Wednesday the forecast for race day was looking like it was a worst case scenario. 3.5m waves….a very scary prospect. Up until that point, I’d been feeling reasonably ok with the event. I knew it was going to be tough, but I wasn’t scared about it. Seeing that forecast, though, the butterflies swooped straight to my stomach and set up camp there for the duration. Bel and I exchanged a few text messages and some of them may have contained swear words…. By the night of the briefing, the forecast had improved slightly, but it was still looking as though race day was going to be a battle. On top of the nerves from that, and all the questions running through my mind that I was hoping would be answered at the compulsory briefing, my motorbike broke down as I headed home from work! Luckily it was close enough that I could walk home, grab my car, and leg it up to Watsons Bay Hotel just in time to make the briefing. There will be 2 white marine rescue boats providing support, plus the organiser’s boat. 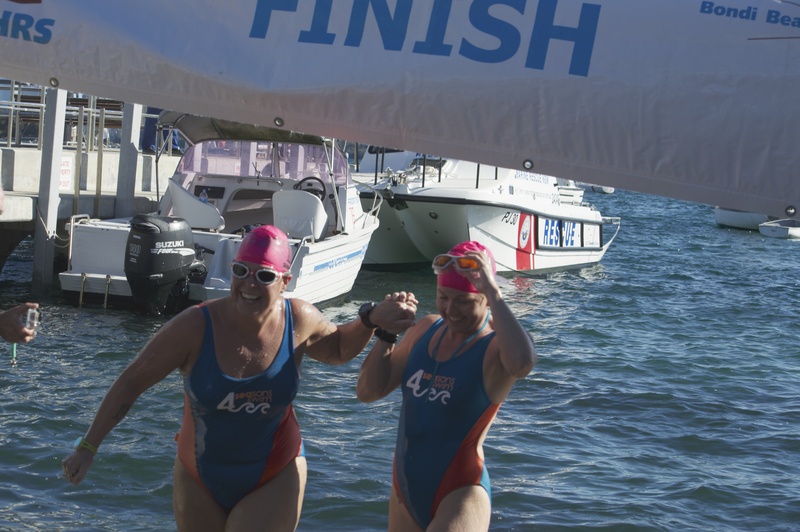 A sign on the boat with the team number is mandatory and needs to be sighted and registered with one of the support boats before the swimmer will be allowed to proceed to that boat and on with the race. For duos/teams, anyone who isn’t starting from the beach can be on the boat. 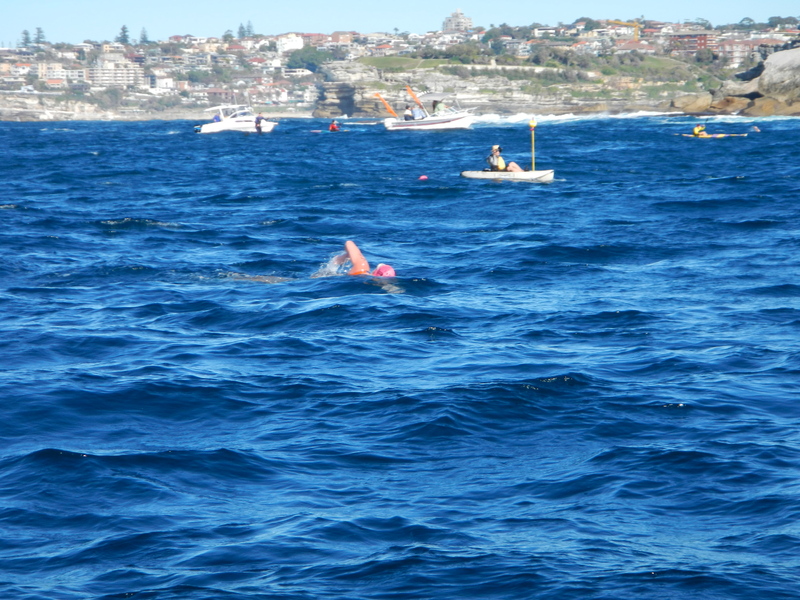 Swimmers must stop and check in with marine rescue at camp cove before crossing the ferry path. The finish line was clarified as the surf club causeway. 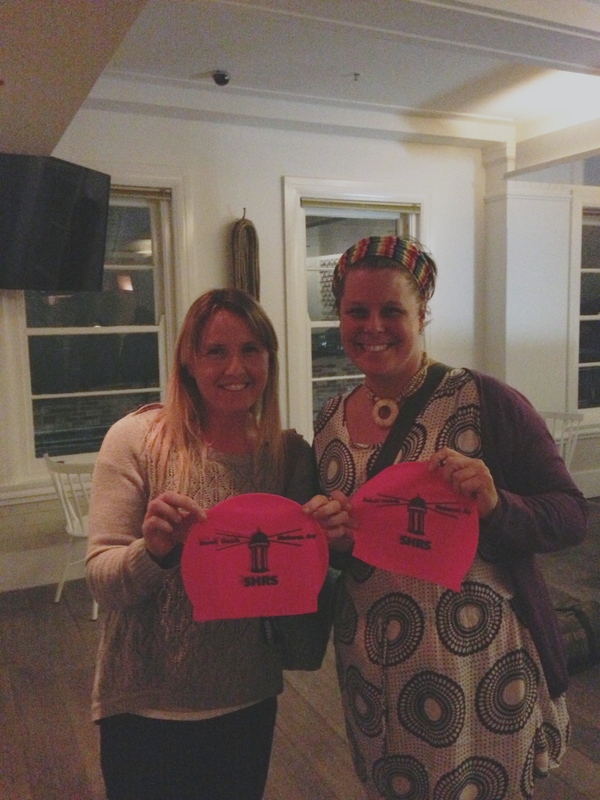 We also received our lucky team number – 51, and our fetching hot pink caps for duos…. Apparently, if you imagine our hands as fluffy ears, the caps look like koala faces! Then it was home for another pre-race alcohol-free high-protein early-to-bed exciting evening! Ah Wednesday night technique sets. Nothing gives me more insight into what I’m doing to make things more difficult for myself. Luckily there’s also nothing wrong with the idea of getting faster, or better, or being able to swim further with no extra input of energy. This Wednesday we were focussing on kicking. I don’t know if I’ve done much on here about kicking. As a general rule, in endurance swimming, kicking isn’t a major component of our swim technique. If you watch shorter distance sprinters swim, you’ll see some crazy 6- and 8-beat kick rhythms that really are part of propelling the swimmer through the water. With endurance event, though, we tend to aim for a 2-beat kick. The reason for this, as I understand it, is that the muscles we use in our legs to kick are large, and therefore use a lot of energy compared to the amount of propulsion you get in return. Your arms, in contrast, have a much better return on investment of energy. In a sprint this is OK, but for endurance events, it just means you wear out quicker. That being said, bad kicking technique can have implications for other parts of your stroke. And I stand up and am the first to admit that I have bad kick technique. In fact, I use the photo below as my Facebook cover photo. It’s a great photo, which is why I use it, but I have to confess that every time I look at it I cringe a little at my bent knee…I’ve added lines in to show what I’m talking about…. The good news is, that there are some really good drills you can do to work on your kick. We did one before we even got in the water. There was a set of stairs leading up from the pool to the grassed sitting area, and we did some practice of good kicking technique with one leg standing on the step sideways, and the other swinging clear. This was great for the coaches to be able to check technique and for us to feel what good kicking feels like (engaging the glutes!). We did various other drills in the pool using fins, and focussing on pointing our toes and not bending our knees. I did feel like it really helped improve my kicking technique (although it will take some time to embed that as a good habit), and as an added bonus, I found that the improved kick helped with my biggest technical challenge -my body position in the water. I tend to have to fight very hard to keep my legs and lower body from sinking down below the surface, and therefore creating unnecessary drag. Working on my kick noticeably improved that, so it’s doubly useful!